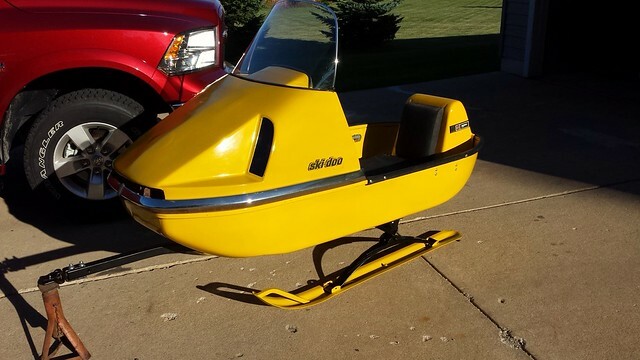 I am looking at a 70 Alpine 399er but have no idea what the value of these sleds are. It runs, both forward and reverse work. Busted up trunk Both tracks look good and all bogey wheels are there. Windshield is there but as usual sun faded. Wrong seat but could use the foam. Welcome to the site PolCat. The trunk is an easy swap from several years of Olympic so thats no big deal. The 70 is nice because its simple, old enough to be reletively light weight and has reverse. There's hope for the windshield too even if its faded. There's a handful of plastic polishes that can make a huge difference in them. Things to look out for on a sled like this are the chassis rust - especially under the seat. Several with electric start dumped acid out and quickly rotted metal nearby. Alpines also rusted right where the seat metal joined to the tunnel top. That being said almost any metal can be repaired. Another thing was the gas tank. The filler tube apparently breaks off near the tanktop. Just to see its all in place. Thanks for that information and the welcome to the site. Where the seat riser meets the tunnel that strip of metal does have some rust spots along it. When the hood was off the filler tube was attached to the tank. I have caught yellow fever. My first Ski Doo rebuild was a 69 320 Oly then came a 70 399 Oly then a 68 Super 370. Waiting inline is a 71 TnT 440 slidder a 71 Nordic 399 and a 65/66 Chateau. I also have a custom 70 Ski Boose and a late model 88 Formula MX 470. Ahhh I recall the 370 rebuild you did - that was nothing short of amazing what you accomplished. Especially from where you started. Cudos for that work! By the way, how is that beast running now? The alpine sounds like it's a decent staring point too. The metal work sounds very doable. And that's a great looking boose! Nice hood work on the light. I have the same job to do on my 71 boose. Had an ok hood that shattered when trailering without a cover. Have a 69 Nordic hood that i'm going to try and do what you already did with yours. How did you fasten yours down? No snow to ride anything around here. For the Ski Boose the Nordic bumper actually fit quite well. Had to make tabs to connect it to the tub.